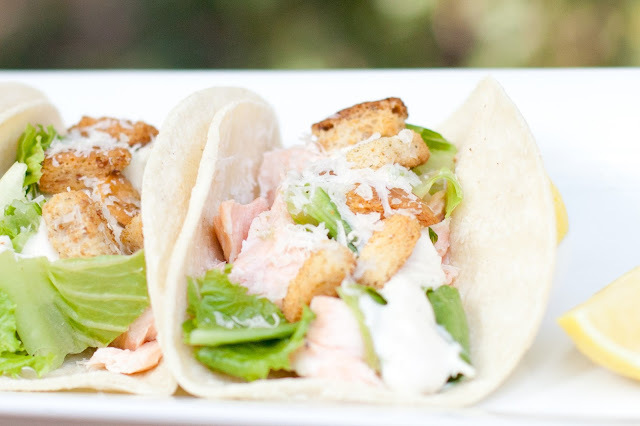 Here's a fun, quirky take on Taco Tuesday... Salmon Caesar Salad Tacos! So easy to put together, and almost too pretty to eat. 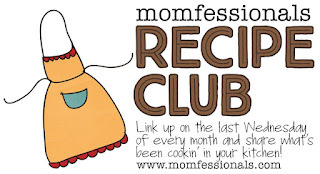 I love a Caesar Salad - it makes a very quick, yummy side for any dinner - so we almost always have a jarred Caesar dressing in the fridge (I like Marie's), plus grated Parmesan (from Costco) and croutons in the pantry (also Costco). But, these toppings also work so well for a Salmon Caesar Salad taco! To build the taco, stuff a white corn tortilla with baked salmon, then basically build the salad on top. Yum! Bake the salmon in a 350 degree oven (about 10 minutes per inch of thickness). I love the salmon from the prepared section at Costco - it's flavored with a bit of basil butter, and it cooks in the same pan you buy it in - so easy, and no dishes! Once the salmon is done, stuff the white corn tortillas (or, chill the salmon if you want it cold). Top salmon with lettuce, add a dollop of the dressing, and sprinkle with croutons and cheese. Enjoy! Another fabulous Taco Tuesday! We're having salmon tonight, but with BBQ sauce and mango salsa - hoping it tastes decent, ha! totally going to try these!! different! Looks so yummy! Giveaway Wednesday - Freshly Picked Moccasins! Giveaway Wednesday - Lil Gadgets Winner! Taco Tuesday - Dinner in 30!